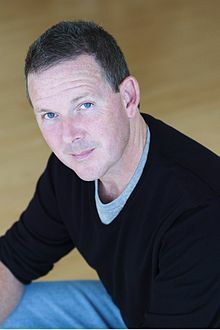 John David Logan (born September 24, 1961) is an American playwright, screenwriter, film producer, and television producer. He is a three-time Academy Award nominee; twice for Best Original Screenplay for Gladiator (2000) and The Aviator (2004) and once for Best Adapted Screenplay for Hugo (2011). Logan was born in San Diego on September 24, 1961. His parents emigrated to the United States from Northern Ireland via Canada. The youngest of three children, he has an older brother and sister. Logan grew up in California and New Jersey, before moving to Chicago to attend Northwestern University, where he graduated in 1983. His play Red, about artist Mark Rothko, was produced by the Donmar Warehouse, London, in December 2009, and on Broadway in 2010, where it received six Tony Awards, the most of any play, including best play, best direction of a play for Michael Grandage and best featured actor in a play for Eddie Redmayne. Redmayne and Alfred Molina had originated their roles in London and also performed on Broadway, for a limited run ending in late June. Logan wrote Any Given Sunday and the television film RKO 281, before gaining an Academy Award nomination for co-writing (with David Franzoni and William Nicholson) the Best Picture winner Gladiator in 2000. He received another nomination for writing The Aviator (2004), starring Leonardo DiCaprio and directed by Martin Scorsese. Other notable films written by Logan include Star Trek: Nemesis, The Time Machine, The Last Samurai, and the Tim Burton musical Sweeney Todd: The Demon Barber of Fleet Street, for which he received a Golden Globe Award. Logan's feature films include Rango, an animated feature starring Johnny Depp and directed by Gore Verbinski; the film adaptation of Shakespeare's Coriolanus, directed by and starring Ralph Fiennes; Hugo, an adaptation of the book The Invention of Hugo Cabret, directed by Martin Scorsese; and the James Bond film Skyfall, along with Neal Purvis and Robert Wade. He wrote the Bond film, Spectre (2015). Two plays by Logan premiered in 2013; Peter and Alice, directed by Michael Grandage and starring Judi Dench and Ben Whishaw opened in London at the Noël Coward Theatre on March 25, 2013 and I'll Eat You Last: A Chat with Sue Mengers, directed by Joe Mantello and starring Bette Midler, opened on Broadway at the Booth Theatre on April 24, 2013. He also created the 2014 television series Penny Dreadful starring Josh Hartnett, Eva Green and Timothy Dalton, for which he served as sole writer until it concluded with its third season. In November 2015, Logan was reported to have rewritten the script for Alien: Covenant. During the audio commentary of Alien: Covenant, Scott mentions that Logan has already started writing Alien: Covenant 2. In November 2018, it was announced that Showtime would produce a follow-up to the 2014 television series Penny Dreadful entitled Penny Dreadful: City of Angels, which takes place in Los Angeles in 1938. Logan will again be creator, executive producer, and sole writer for the show, which is set to premiere in 2020. Superhero, a new musical by Logan and Tom Kitt, will have its world premiere production Off-Broadway at Second Stage Theatre, with an official opening night on February 28 2019. Winner, 2010 – Tony Award Best Play, for Red. Nominated, 2004 – Academy Award for Best Original Screenplay, for The Aviator. Nominated, 2000 – Academy Award for Best Original Screenplay, for Gladiator. ^ Stockwell, Anne (March 1, 2005). "Logan's run: one of Hollywood's hottest screenwriters, The Aviator's John Logan proves that you don't have to be straight to write the blockbusters". The Advocate. ^ "Red". Donmar Warehouse. February 6, 2010. Archived from the original on March 11, 2010. Retrieved March 16, 2010. ^ "Time Is Short to See Tony Winners" by Patrick Healy, The New York Times, June 14, 2010 (p. C1 2010-06-15 New York ed.). Retrieved 2010-06-14. ^ Schaefer, Sandy (November 11, 2015). "Alien Paradise Lost Script To Be Rewritten By John Logan". ScreenRant. Retrieved November 27, 2017. ^ Lodge, Guy (November 5, 2015). "Watch Ridley Scott Receive His Star On The Hollywood Walk Of Fame". Variety. Retrieved November 27, 2017. ^ Chitwood, Adam (September 1, 2017). "38 Thing We Learned From Ridley Scott's Alien Covenant Audio Commentary". Collider. Retrieved November 27, 2017. ^ Clement, Olivia (October 23, 2018). "Thom Sesma and More Will Join Kate Baldwin and Bryce Pinkham in Superhero Musical". Playbill. Retrieved January 10, 2019.